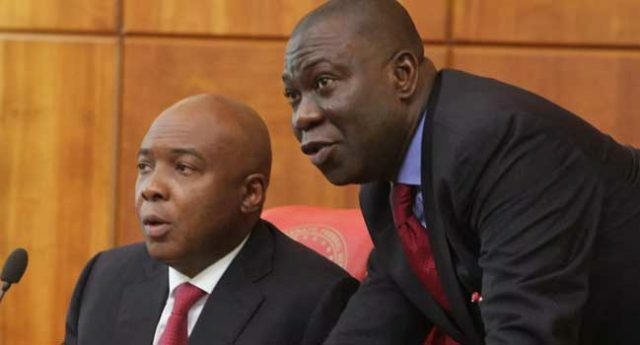 The Senate President, Bukola Saraki, has accused a former Governor of Lagos State, Bola Tinubu of peddling falsehood against him. All governance principles which were required for a healthy functioning of the party and the government were deliberately violated or undermined. And all entreaties for justice, equity and fairness as a basic precondition for peace and unity, not only within the party, but also the country at large, were simply ignored, or employed as an additional pretext for further exclusion. The experience of my people and associates in the past three years is that they have suffered from alienation and have been treated as outsiders in their own party. Thus, many have become disaffected and disenchanted. At the same time, opportunities to seek redress and correct these anomalies were deliberately blocked as a government-within-a-government had formed an impregnable wall and left in the cold, everyone else who was not recognized as “one of us”. This is why my people, like all self-respecting people, would do, decided to seek accommodation elsewhere”. It should be noted that he has not forgotten the fact that I took the bull by the horns and told him that in the interest of the country, he should accept the need for the party to present a balanced ticket for the 2015 General Elections in terms of religion and geopolitical zones. Since that time he has been very active; plotting at every point to undermine me, both within and outside the National Assembly. It should be known that Democracy is a system that allows people to freely make their choices. It is my choice that I have decided to join others to present a viable alternative platform for Nigerians in the coming elections. Tinubu and leaders of the APC had better respect this decision or lawfully deal with it. As for me, Allah gives power to whom He wishes. Human beings can only aspire and strive to fulfil their aspirations.